Protect your deck from burns! The 16in x 16in size is perfect for fire pits from 18 to 26 inches. The DeckProtect® is a fireproof mat that protects your deck from burning from your firepit or chiminea. The DeckProtect® is hand crafted in the USA and is the only one of its kind. The DeckProtect® is woven with volcanic rock fibers and designed to withstand high temperatures to protect your deck or patio from heat damage. 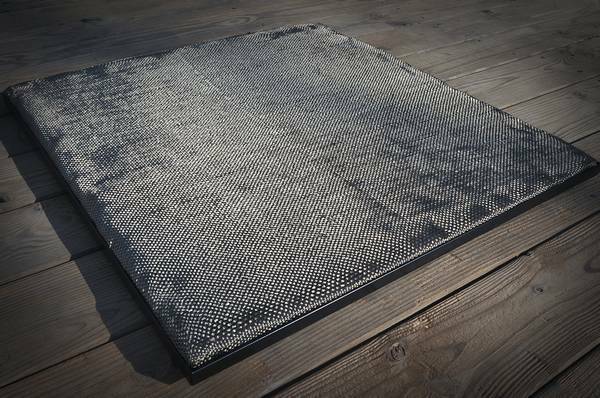 These mats are perfect for grills, portable fire pits, and chimineas. These mats will last for years allowing you to enjoy both your deck and the warmth and comfort from a firepit or chiminea. The heat that comes from a firepit or chiminea is ususally about 1,000 to 1,200 degrees. The DeckProtect® has been tested and will withstand 1,400 degrees for an extended period of time with no damage to the mat or your deck or patio. They are rigorously tested to ensure that they deliver the best protection for your deck or patio from heat damage. This mat also comes with a rack that lifts it off the deck to prevent moisture build up underneath.